Sand any rough edges and smooth out the flat surface for painting. Paint the entire plaque white, let dry, apply a second coat. Paint the rim of the plaque with red and let dry. Use a red Sharpie to draw on the “stitches”. To do evenly, use a round object such as a jar or bowl, and trace around it on a piece of scrap paper. Use this scrap paper as your guide by laying it over the plaque and drawing your lines around the edge. Decorate with stickers. 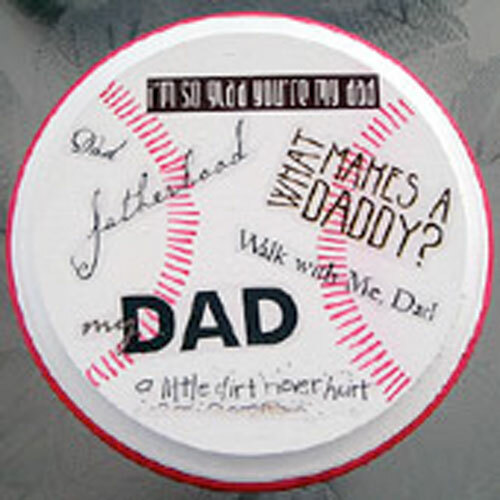 There are a variety of different stickers available with fatherhood type sayings and phrases. Check out the scrapbooking and sticker aisles of your local craft supply store. Spray entire surface with acrylic sealer spray and let dry completely, overnight is best.